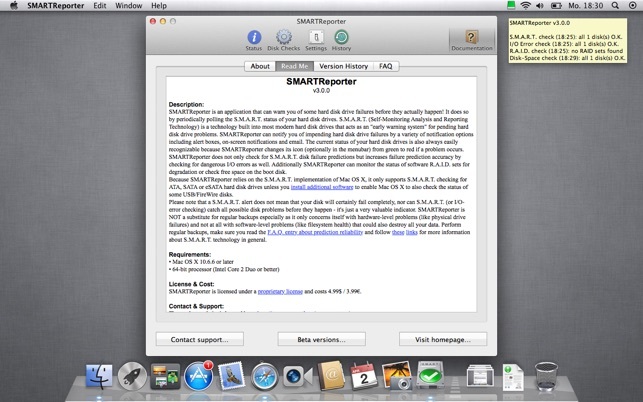 SMARTReporter periodically checks the built-in S.M.A.R.T. status of all compatible connected disks. S.M.A.R.T. (Self-Monitoring Analysis and Reporting Technology) is a technology built into most modern hard disk drives that acts as an "early warning system" for pending hard disk drive problems. SMARTReporter has the unique capability to check the system kernel log-file for occurrences of dangerous "I/O errors" to improve the disk failure prediction accuracy. SMARTReporter can automatically check whether connected R.A.I.D. sets become "degraded" or just "offline". 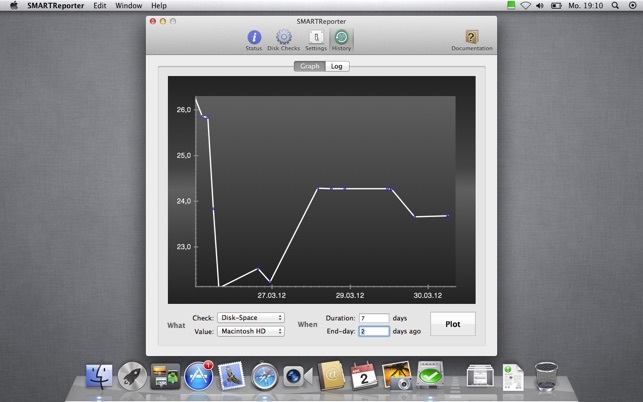 SMARTReporter can also monitor the free disk space because a completely filled boot disk might lead to system lockups. 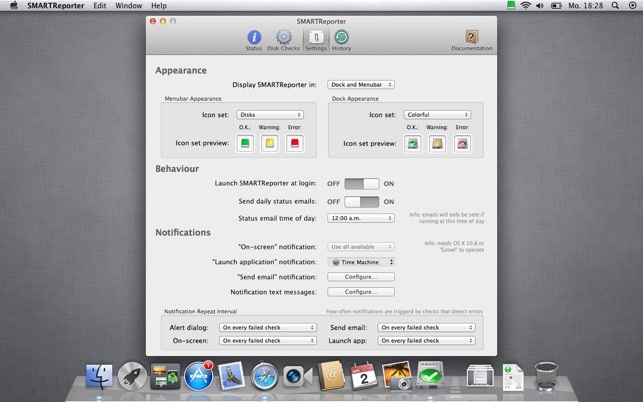 SMARTReporter has completely customizable notification options for all four disk checks including notification via changing application icons, email, alert dialogue, on-screen notification (Growl or OS X 10.8 native), or by launching arbitrary applications / scripts. 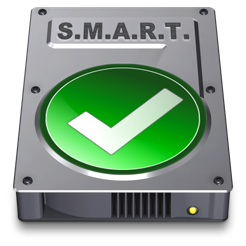 SMARTReporter supports a variety of advanced options and tools including automated S.M.A.R.T self-tests, scheduled S.M.A.R.T. attribute checking and plotting graphs of all acquired data over time. Please note that the S.M.A.R.T. self-test/attribute-check features aren't officially supported. Because SMARTReporter relies on the S.M.A.R.T. 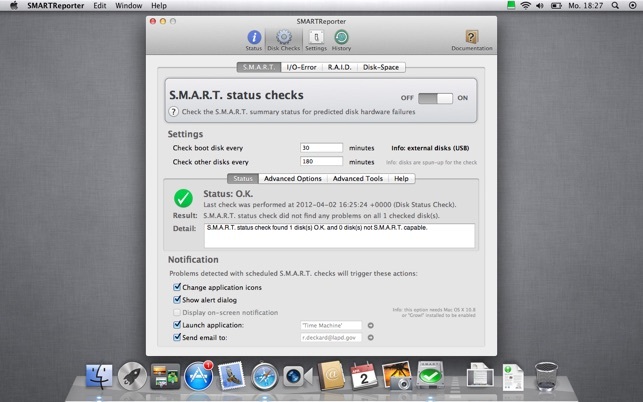 implementation of Mac OS X, it only supports S.M.A.R.T. checking for ATA, SATA or eSATA hard disk drives unless you install additional software to enable Mac OS X to also check the status of some USB/FireWire disks. - the "OWC Aura SSD for Mac Pro"
Please note that a S.M.A.R.T. alert does not mean that your disk will certainly fail completely, nor can S.M.A.R.T. (or I/O-error checking) catch all possible disk problems before they happen - it's just a very valuable indicator. SMARTReporter is NOT a substitute for regular backups especially as it only concerns itself with hardware-level problems (like physical drive failures) and not at all with software-level problems (like filesystem health) that could also destroy all your data. Perform regular backups and make sure you read all the documentation and the F.A.Q. entry about prediction reliability. Meine externen Platten werden per USB nicht erkannnt. Per USB 3 scheinbar ja, aber nicht über den anderen Port über den ich gerade alle Platten formatiere für mein RAID. Warum das so ist? Keine Ahnung, bin aber wohl nicht der einzige. Schade, dass ich dafür Geld ausgegegeben habe. Funktioniert leider nicht wenn die Festplatte via USB angeschlossen ist. Das Programm funktioniert nur bei internen Festplatten /SSDs. Sobald die Festplatte via USB angeschlossen wurde ist es nicht möglich die SMART Daten auszulesen. Damit ist das Programm für mich nutzlos. Schade das sowas nicht klar kommuniziert wird und seitens Apple es da 0 Kundenservice gibt. PS: ich habe darauf hin die Festplatte mit meinem Windows Firmennotebook mit CrystalDisk ausgelesen, 0 Probleme, hat alles einwandfrei auf Anhieb funktioniert - kosten los. Schade wie hier mit jahrelangen treuen Kunden umgegangen wird. 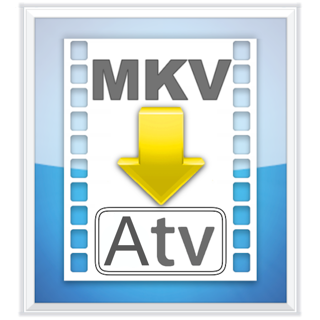 Bin mit diesem Programm absolut zufrieden! Bei uns läuft SMARTReporter Version 2 bereits seit ca. 2 Jahren unter Snow Leopard auf mehreren Macs sehr zuverlässig. Auch diese neue Version 3 im App Store läuft unter Lion sehr stabil und man hat viele Einstellungsmöglichkeiten besonders hinsichtlich der Benachrichtigungsarten. Das Programm ist m. E. auch gut für SSDs geeignet (getestet in einem Mac Pro mit Crucial M4 inkl. TRIM-Support und 2 normalen HDDs). © 2018 CoreCode Limited. All rights reserved.